The Democratic Party needs only two seats in both the Senate and Assembly to meet that milestone, though it is more likely to occur in the Senate. With a two-thirds majority in the Senate, Democratic lawmakers would have enough votes in that chamber “to approve tax increases, override the governor’s vetoes, and bypass legislative rules and deadlines,” the Chronicle reported. Democrats currently hold 25 of the 40 seats in the Senate. And because of recently redrawn district lines, they could pick up as many as four additional seats. The decision by 17th Senate District incumbent Sen. Sam Blakeslee, R-San Luis Obispo, not to run again will probably assure a win for Assemblyman Bill Monning, D-Santa Cruz. Even so, Republicans remain hopeful that if their candidates focus on jobs and the economy, they will keep the Democrats from reaching a supermajority. On the Assembly side, Republicans contend they can increase their membership by as many as three seats for a total of 31, leaving the Democrats with 49. Currently the Democrats hold 52 seats and the Republicans have 28. Remaking the once great state of California in Detroit’s image. Time to move to a free state. Don’t let the door hit ya where the good Lord split Ya !. Where ya headin’ , Galahad ? BTW …that term “super-majority” is deceptive. If needed legislation is stifled, if regular government functioning is constipated by a minority of do-nothings that prevent normal majority rule; then, that is a condition that requires fixing. This cult-like clan of obstructionists and anti-civilization nihilists MUST be voted out and never again allowed anywhere near power. They have subverted the concept of ‘checks and balances’ and have corrupted it into an unbalanced, permanent brake on progress. What do people DO with dead horses, anyway ? When will your anger cease? Your side has won. The Republicans will soon be nothing in the legislature with no power. Why are you still angry? I am stunned with your reaction to what should be good news for you. Oh Lord …You mean that now there is the possibility that California can escape the grip of gridlock and inaction from a dictatorship of MINORITY obstructionists ? I post this as a new comment, rather than replying to so many previous ones that are parroting similar tropes. Mayans and Frenchies and Demmies, OH MY ! You brave Republicans sure get spooked easy ! I can see it now, 50% sales tax, 50% income tax, property tax of 50% of your assessed value every year! The only people left in the state will be the Government workers, the illegal aliens and the unemployed. A veritable Utopia! Drinking your TEA with steroids way early on a Monday morning, huh ? Or is it the reactionary paranoid Heebie-Jeebies from chronic addiction ? Hey…France just voted OUT the FAILURE of conservative austerity. They finally got smart and figured that you can’t grow by going backwards. When will America get smart and just admit that ‘trickle down’ is and always has been a fraud ? In reply to both of your comments, why are you so angry that you’re winning. It appears that the Republicans will soon be an ineffective minority, and the Democrats will be free to pass whatever they want. Why the anger when you win the position of not having to deal with the opposition anymore? Oh, it’s not anger !t’s GLOATING ! The Republicans in their extremism, lockstep partisanship, and total intransigence for working towards common solutions did this to themselves. In the words of Gore Vidal, “The four greatest words in the English language are ‘I told you so’ ” . There is no better satisfaction than sitting back calmly, while you watch the enemies of civilization self destruct. It’s not gloating. It’s fear. No more excuses for screwing things up. No one else to blame. I think you are right. The Democrats have depended on the Republicans to hold down spending and taxes. Without them, there will be bills that moderate Democrats will not want to pass, but they will all be passed at least in the beginning. In time, the moderates may become the new “Republicans”. With the redistricting and the increase in people depending on the government for programs, I think it is unlikely that Republicans can do anything now but lose numbers. This is so funny ! This slow motion projection and delusion is like watching one of those “World’s Dumbest Criminals” programs. Completely predictable disaster . Don’t let me stop you. It’s HILARIOUS ! So, what bills are you most interested in being passed by the legislature this year? Wait….. YOu said I was angry, implying that I was in some way irrational . You want me to treat YOU with respect, YOU have to start out that way . Otherwise, I play Chicago rules. In other words, you don’t have a clue as to what is being proposed in the legislature that will be passed with the Democratic majorities. Precisely why I’m moving to San Juan Island. Good weather doesn’t trump totalitarianism. Welcome to Taxafornia…………Never met a tax they did not like. Let the spending begin. We have too many (not all) Democrats who are in the legislature to get money for their special constituents, and not to work for the benefit and success of the state. 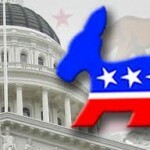 Their loyalties are not to the State of California, but to their own special interests. Well when this happens the fiscal ruin of California will just about be complete.